See Bottom Of This Page For Our New Pricing Discounts! Come in and see our selection of wood mouldings from several leading manufacturers. From a simple table top frame to a hand guilded Italian gold victorian masterpiece with such intricate detail you have to see it to fully appreciate what goes into it. Frame moulding is cut and joined here on premises. 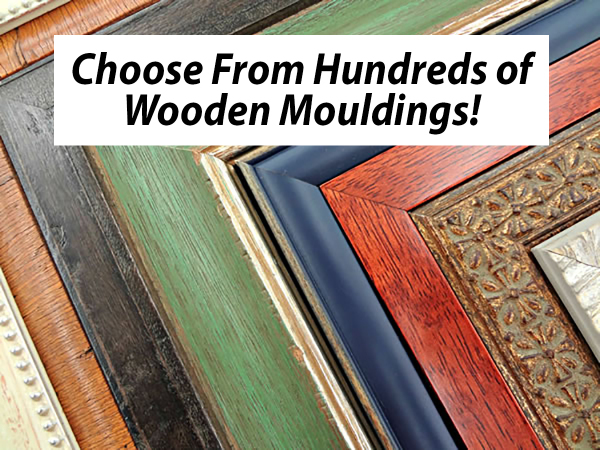 Deep discounts apply to frames made from in stock moulding. We've got hundreds of feet of moulding here at the frameshop. Basic hardwoods made harvested from environmentally controlled forests are a responsible choice. sea shells glued on by hand, one that has the colors of the American flag, and we've even made frames out of hockey sticks! 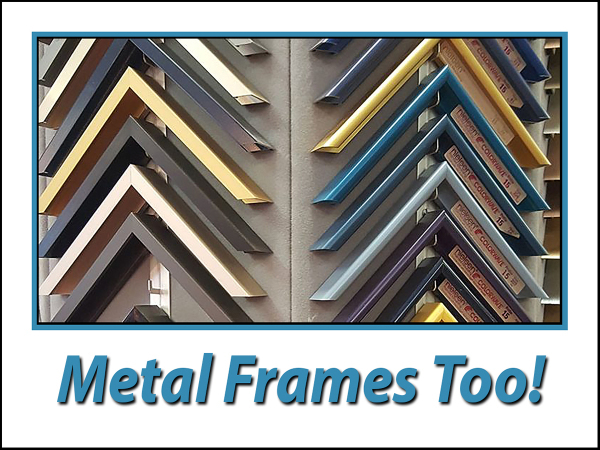 ​ Metal frames can give your artwork a clean simple look with a minimal amount of frame width showing. When putting together a collection of work to show, metal moulding has the durability to be able to transport it over and over without worrying about putting dings on the surface like wood moulding. Many sheens are available like glossy, matte, textured and etched. An advantage of using metal frames is the ease of dissassembly and reassembly. If you want to change out artwork, a simple flathead screwdriver to loosen the corners and needlenose pliers to remove the spring clips is all you need. Just have Jon mount your new artwork and you're all set. Profiles are no longer limited to a simple round cap front. Now you can choose a flat front, semi rounded edges and many different depths. Sometimes custom framing is more than you want to spend on a particular piece. 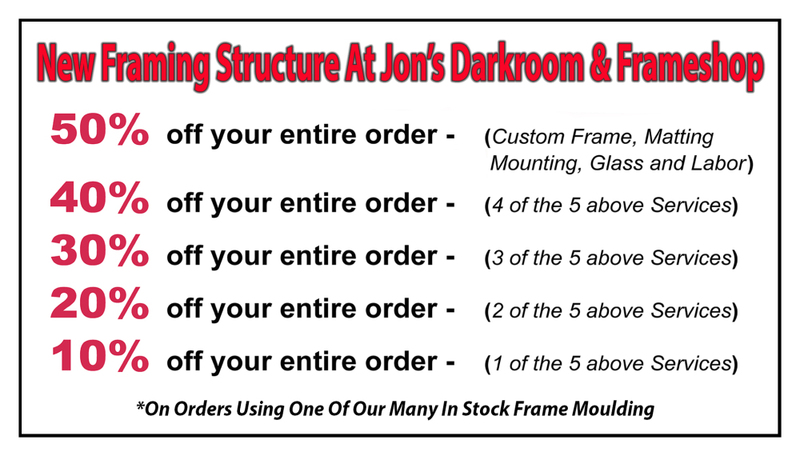 We completely understand that here at Jon's Darkroom & Frameshop. That is why we have a really nice collection of readymade frames you can purchase and take home or leave with Jon and have him do the assembly for you. Some of our ready made frames are just as you would expect, good quality simple frames that come with glass and an easel back. These are great for your basic framing needs like a snapshot you want to display on your desk. 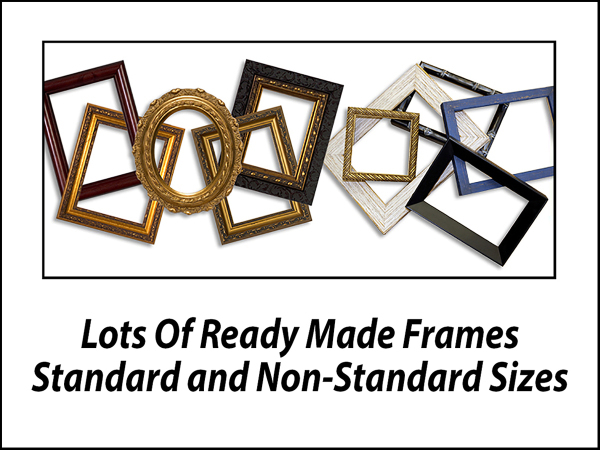 Other ready made frames we have in stock are made from left over custom frame moulding. These beautiful frames give you the unique look of a custom frame without the price. They run about 20% of what they would cost if they were ordered as a custom frame. Come check them out! Matting can make or break the look of your custom framing project. So many choices can make your decision a daunting task, but Jon will help you by using his designing experience and will ask you the right questions to get a feel for what is the right look for you. Many of our customers leave Jon their work and ask Jon to "do his thing" and create something beautiful. This give Jon the time to try different possibilities and come up with the perfect solution. Jon uses only acid free mats at his frameshop. This assures the artwork will look as good in 5 years as it did when you picked it up. Mat replacement is a good thing to do if you have some artwork framed several decades ago. Acid damage awareness was not present back then. We can open your frame, replace the matting with acid free choices and put it back together again. ​ These days there are so many mat choices. 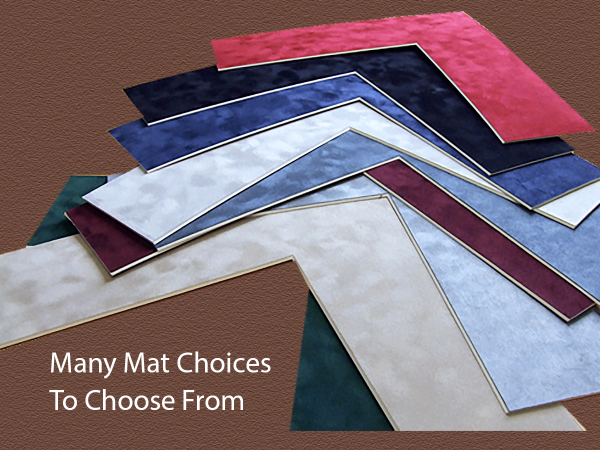 Many colors to choose from, textured mats, glossy mats, solid core mats (rather than a white core, the bevel part of the mat matches the front side color) black and color core mats. Proper mounting is paramount to the longevity of your framed artwork. Hinge mounting which supports your artwork by the two uppor corners using acid free tape or adhesive. Dry mounting which adheres your artwork to a foam board using a heat press. This can be done either permanantly or in a way that is reversable. After mounting, spacers can be used to keep the glazing from coming in contact with the artwork. Sometimes, mounting is not even necessary. In this case just a backing board is used to support the artwork. 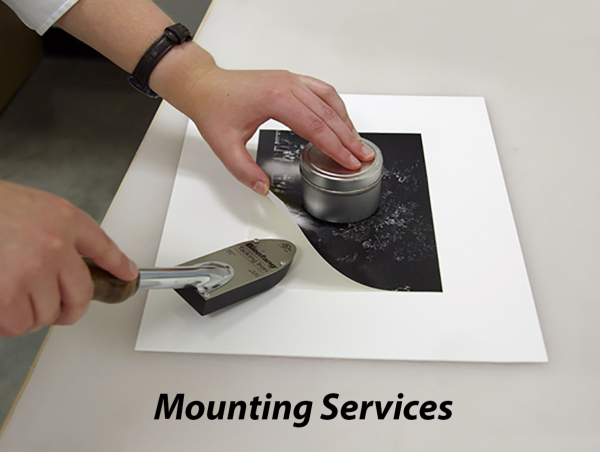 Jon will help you decide which method of mounting will be best for your particular situation. After all the design work is complete and the mounting and mat cutting has been done, choosing the correct glazing is the next step. 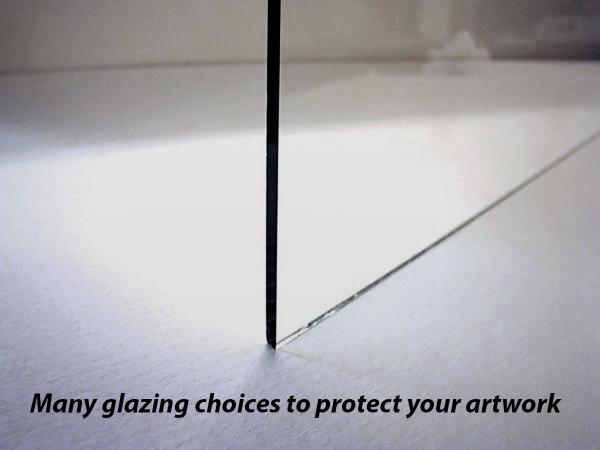 The glazing you choose impacts the perception of your artwork in an impactful way. Firstly, decide between Plexi or Glass. Plexi is useful for larger pieces when weight is a factor. It's also better to use when safety is an issue, like hanging framed artwork in a child's room for example. Secondly, UV protection is the next factor to consider. If you expect to enjoy the artwork for years to come, glazing with UV protection is the only way to go. 90% of the work framed here is done with glass that keeps the UV light away from the artwork. Thirdly, there are choices to made concerning the reflection value of the glazing. There is clear glass, reflection control and museum glass which offers not only UV protection, but a clarity unmatched by other glazing.